IVLP alumnae discuss countering violent extremism and other topics at the “Building Resilience to Radicalization and Violent Extremism” conference in Aarus, Denmark. 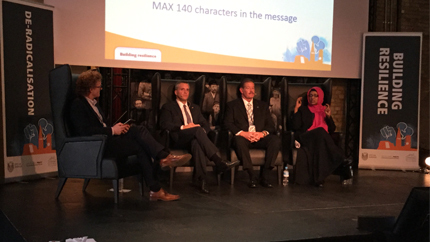 The Danish city of Aarus partnered with the Strong Cities Network (SCN) to host a timely two-day international conference titled, “Building Resilience to Radicalization and Violent Extremism” November 19 – 20, 2015, only six days after the terrorist attacks in Paris. The face behind this conference is International Visitor Leadership Program (IVLP) alumna Natascha Mannemar Jensen, who traveled to the U.S. on the “Women Against Extremism” program in June 2015. Natascha credits the program with giving her the original idea for the Aarhus conference. The conference focused on the themes of Online Radicalization and Community Outreach, topics inspired by a White House Summit on Countering Violent Extremism (CVE) with the mayors of various U.S. cities that Natascha and her fellow IVLP participants attended during their tour. Coordination towards empowering more credible voices on the internet and social media is sorely needed to counter online radicalization and the sophisticated digital operations of extremists. The conference included a presentation by fellow “Women Against Extremism” IVLP alumna Shareen Aziz-Williams from the United Kingdom and was attended by two other alumnae from Norway and Switzerland. All 24 alumnae of that program keep in frequent contact and constantly exchange ideas in support of their CVE work, demonstrating the lasting impacts that these programs can have on building international bonds in support of key global issues.